If Muslims expect to be perceived as peace loving people of consciousness, piety, and worthy of being shining examples of the Islamic faith - let not one of them side with the President or even myself, but with the knowledge that, as Muslims, respecting the area of Manhattan known as 'Ground Zero' is the least we can do as one of the most significant demonstrations of good faith, charity and above all, the utmost compassion. After all, isn't the Muslim community yearning to be treated with the same qualities? PRLog (Aug. 25, 2010) MWA-Net—It is most certainly regrettable at best, that certain television and news networks and certain politicians—Republican and Democrat—have latched onto this paranoia, this 'fear', of Muslims in the United States—more broadly referred to as Islamophobia—for economic and political gain ahead of November's midterm congressional elections, using Park51, Islam and members of the Muslim community as their whipping post. However, in rushing to the pulpit waving the U.S. Constitution in one hand, and a microphone in the other to defend the wisdom of Park51 organizers to construct a 15-story mosque and cultural center on property encompassing the area of the collapsed Twin Towers of the World Trade Center, a/k/a 'Ground Zero', members of the Muslim community might not realize they've been unwittingly duped into sabotaging nine years of image repair, fence-mending and dialogue efforts. Yes, indeed, Islamophobia is a growing problem in the United States. However, in the case of Park51, rather than jumping in and taking the religious freedom bait, which the Islamophobes knew the Muslim community would do, our leaders should have paused, consulted more closely among and better organized their response to the ensuing attack. But they jumped out of the starting gate like horses at a race track without fully grasping the significance of the defeat already dealt to the opposition when the New York City Landmarks Preservation Commission voted 9-0 against granting historic protection on the Burlington Coat Factory building and land where the $100 million center is proposed to be built. The decision, made August 3, is described as being the final hurdle in the quest for approval. This approval was made based on a Republican sponsored law called the 'Religious Land Use and Institutionalized Persons Act', crafted to address a common problem often ignored by the courts: local government bodies using zoning authority to prevent religious institutions from moving in or expanding their operations. The law protects the right of Muslims to establish mosques, even where such a building might be unwelcome. The law says, "No government shall impose or implement a land use regulation in a manner that imposes a substantial burden on the religious exercise of a person, including a religious assembly or institution," unless it meets very strict conditions. Nor may any government inflict a regulation that discriminates "on the basis of religion or religious denomination." New York City could have invoked its landmarking power to kill the project, but thanks to the 2000 law, a court challenge was destined to be lost. The commission did everyone a favor on August 3 by ensuring that the debate would lose wind sooner rather than later. Which brings us back to the issue of reflecting on when our actions (or decision not to act), cause the greater harm; or have the greatest hope for improving an issue as near to epidemic proportions as Islamophobia. The writing was on the wall when the Park51 organizers chose the Burlington Coat Factory site for Park51; a location rife with lingering sensitivity, pain, anguish, and the memory of devastating loss. And now, because so many rushed so quickly in defense of the religious freedom outcry, that was already guaranteed by law, rather than pausing and tapping into their collective wisdom in deciding how to deal with the newest Islamophobic attack on their community, the perceived gains the Muslim community had worked so hard to nurture in dispelling the misconceptions and distrust generally perceived by non-Muslim U.S. citizens toward Muslims has been dealt a tenuous blow. All because our mainstream Muslim leadership jumped to the microphone to gather its flock, whom they knew would blindly heed their call to rally against Islamophobia via Religious Freedom. Yes, we should abhor Islamophobia, but greater wisdom should have been exercised in determining the most beneficial position to assume with regard to Park51. It is not unrealistic to consider that Park51 organizers were confident from the onset that their plan would get as far as it has today—the law was already in their favor—all they had to do was be patient and ride out the storm. A U.S. State Department funded tour of the Middle East would go a long way in keeping one Park51 organizer out of the cross-fire. Conspiracy theories aside, this is what the American public generally understands about 9/11; the people responsible for hijacking the airplanes were Muslim, their religion was Islam, and 3,000 people died in downtown Manhattan when they strategically and intentionally flew two airplanes into the Twin Towers of the World Trade Center. And now they know that Muslims, waving the United States Constitution and heralding U.S. Law have landed once again, only this time on hallowed ground. I read a comment yesterday that said, "I have no idea what the Burlington Coat Factory is." 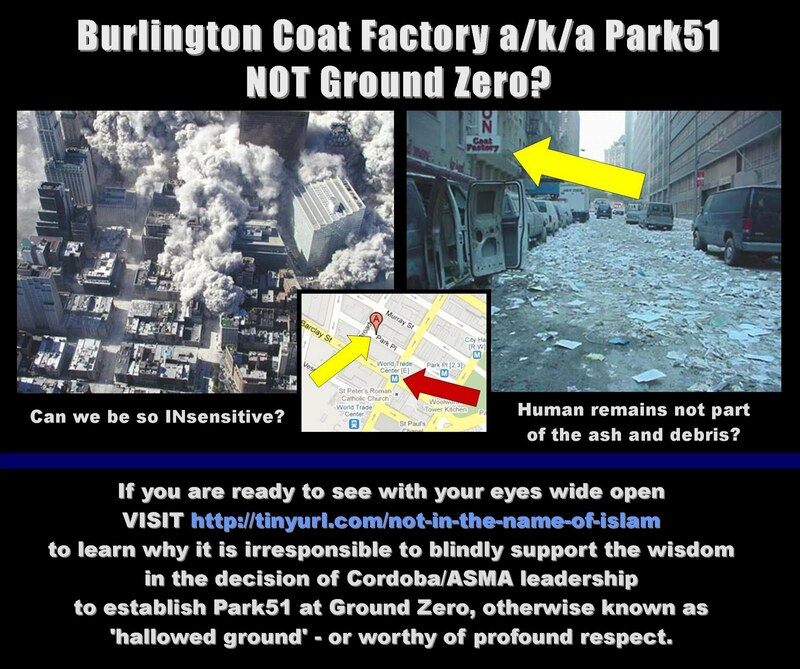 There are likely many who are unsure about the significance of the Burlington Coat Factory/Park51. It is often said that an image is worth 1,000 words so in the interest of facilitating continued dialogue and understanding, I embarked upon creating an image file that would, in less than a thousand words, allow people to understand what sometimes only an image can convey. The Burlington Coat Factory is on the property that Park51 organizers have purchased for their proposed 15-story mosque and cultural center. As you can see from the photo included with this article, despite protests to the contrary the building is, indeed, on property encompassing the plume of ash and debris that was once the Twin Towers of the World Trade Center, and tragically, human lives. Thus, the argument that the area, also known as 'hallowed ground'—or worthy of profound respect—is not part of Ground Zero, has no merit. A reader of a recent New York Times article published on the debate commented, "A group committed to southern culture might have the right to erect a confederate flag on private property adjacent to Dr. Martin Luther King's grave site, but to do so might be understandably offensive and therefore in poor judgment. It is legitimate to make that distinction." Many opponents of the Park51 location see it as nothing short of a slap in the fact—an act of arrogance. President Obama offering that he would not comment regarding the wisdom behind the site chosen by Park51 organizers should legitimately make every Muslim reflect. If Muslims expect to be perceived as peace loving people of consciousness, piety, and worthy of being shining examples of the Islamic faith—let not one of them side with the President or even myself, but with the knowledge that, as Muslims, respecting the area of Manhattan known as 'Ground Zero' is the least we can do as one of the most significant demonstrations of good faith, charity and above all, the utmost compassion. After all, isn't the Muslim community yearning to be treated with the same qualities? And doesn't the Muslim community also have historical sites and landmarks within its own faith tradition that are regarded as hallowed ground? I'm thinking there isn't a Muslim on the planet that hasn't heard of Mecca and Madinah. Let us, indeed, be unified; but let us err on the side of caution, and be unified on the side of morality. Muslims must correct themselves. 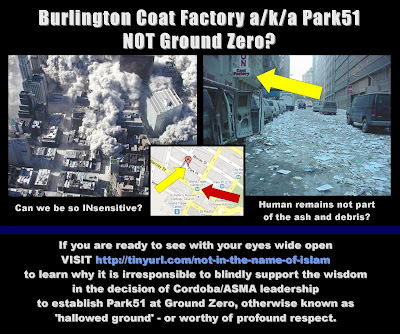 They must demonstrate the same sensitivity that they expect to be treated with; and constructing Park51 at Ground Zero is nothing short of an act of defiance and disrespect. As a Muslim, if someone you respected as a leader asked you jump off a cliff to your death, would you? No, of course not; suicide is strictly forbidden in Islam. Neither should members of the Muslim community stand idly by, allowing one another to be led in the wrong direction, just because a group of leaders did not make a wise choice. Sharif El-Gamal, chief executive of SoHo Properties and Park51 developer, praised the August 3 hurdle-clearing decision. He said the center represented "an American dream which so many others share." Mr. El-Gamal, need you be reminded that 3,000 people that are now dead had lives and dreams to share, too. Daisy Khan, co-organizer and wife of Imam Feisal Abdul Rauf, in an interview on the ABC morning program "This Week", described the recent protests against Park51 as metastasized anti-Semitism. She stated, "That's just what we feel right now. It's not even Islamophobia; it's beyond Islamophobia. It's hate of Muslims, and we are deeply concerned." Ms. Khan, there are others who share your concern about Islamophobia, but do you really believe in your heart that imposing an institution based on a religion that is not compatible with compulsion, on people that are not ready for such a presumptive move, holds any hope of either changing how they feel or repairing the damage to the image of Muslims and Islam that has taken nine long years for the Muslim community at-large to correct; work that continues today? New York City has already sided with you. Your point is taken. Can't you now foresee that achieving the goal you aspire toward with Park51 can be done from a location outside of hallowed ground? Wounds take time to heal Ms. Khan. Park51 isn't going to mystically erase pain or its memory. Six months ago in a Cairo lecture hall Imam Rauf stated that he was a peacemaker and that Muslims need to understand and soothe Americans who fear them and that they should be conciliatory. Imam Rauf, you can still convince those students of that which you spoke; it is not too late to make peace. Your congregation upholds you as being understanding, kind, generous, compassionate; conciliatory. Let the rest of the citizens of the United States see that side of you, too. People make mistakes every day. As a former employer of mine once said, "That's why pencils have erasers." I hope our message reaches you while you are upon the best state of health and emaan in this blessed month of Ramadan, in which it is encouraged that we engage in daw'ah to Allah as much as we can. 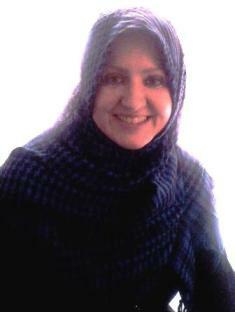 And what could be the easiest way to do act of calling to Allah than just posting a blog or sending an email. 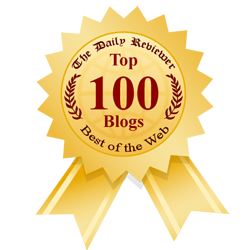 We are not intending to SHAM in HERE by posting COMMENTS... but..
to your blog[s] and also by posting to your group[s]/contact list. And indeed your reward is with Allah and you can anticipate the huge reward based on the below hadith of our Prophet sallallahu alayhe wa sallam who didn't speak from his desire rather by the command of Allah. Therefore, we hope O sister/brother that you seeking the pleasure of Allah in this blessed month of Ramadan you will just simply copy paste above given link's blog post to your blogs and also send it to your groups and contact list as an act of worship seeking nearness to Allah. May Allah reward you with good in this Duniyah and In the Akhira for cooperating with us upon Birr - righteousness - and Taqwa - piety as Allah has ordained. I'm not exactly sure why a community center should cause any concern whatsoever. I don't think if they built it another block away, it would somehow ease Islamophobia and make those that are already hateful towards Islam more compassionate with our religion. In fact, as many have pointed out, there is already a mosque located closer than this community center would be. That mosque has been there for a while. Surely, a community center should not be a cause for concern. I think it is time we stood up and told other Americans that we are Americans too, who just happen to be of a different faith. I think maybe this community center will be a catalyst in that process? This was not a big deal until some politicians made into one.